Wood smoke smells like Dungeons & Dragons to me. The Swords of the Old Gods. Three Griffons, to kill your players. I was building a fire last week to do some back yard cooking, and as I was poking up the coals, the smell of the smoke brought back to mind a certain experience of D&D. They say that sense memories associated with smell are the most powerful and long lasting. So, I thought I'd ask you guys what sort of things have associations with gaming in your minds. What triggers memories, or gaming related thoughts for you? I know scouting is quite unfashionable and un-PC now. Anytime I run into a discussion of it online, it takes an awful bashing. That all goes right over my head I'm afraid. My experience of scouting has no connection to what everyone wants to attack it for today. Like my view of old guard gaming vs the popular view of same I suppose. Anyway, at camp we had those big canvas wall tents with the wood frames that open at each end. What we did was set up our tents in a five pointed star shape, with the inside corners touching, and then cover the open center with a big dining fly. We supported the center like a big top with a pole cut on site. This gave us a very big indoor space for gaming. Now I never experienced any flack for playing D&D as a kid. Our scoutmaster didn't care a whit. We may not have been your average scout troop though. At least, what we did as scouts doesn't seem to have much in common with what the internet thinks scouts do. We dragged a stereo and several car batteries with us so we could blast AC/DC and Black Sabbath in camp. We brought coolers loaded with Cokes, candy bars and chips to sell to the other troops at usurious rates. Black Elk speaks, Tom Brown's woodscraft books and the teachings of Don Juan were passed around at night and were just as esteemed as the DMG and the Scout field manual. During the day we'd go tromping around in the woods and do scout stuff, and at night we'd game until we passed out. It was D&D camp as much as it was scout camp. Hmmm, I bet I could get some takers for an adult D&D camp now. What would you guys think of two weeks with nothing but gaming and camp cooking without distractions? That's a mostly rhetorical question. I can't swing the time myself. It's a nice idea though. So, what apparently non-gaming related thing makes you think of gaming? 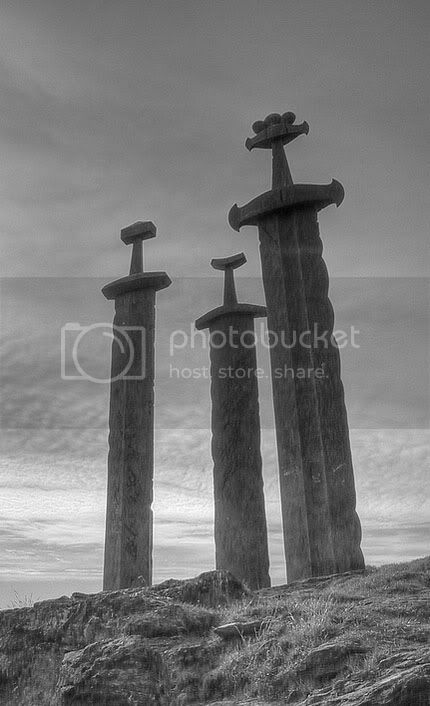 On a sea washed spit of barren stone, on the bleak northern face of the frost glazed Thillonrian Peninsula, Three gigantic swords, ancient and worn, uprightly pierce the shore rock and stand in silent, unknown vigil beside the grey ocean. Far larger even than the weapons of the greatest giants, the hoary blades, tarnished and pitted by millennia, are known to few, and are less than dim legend to most. Fractured tales and tattered bits of folklore tell of many stories attached to the mighty war brands. Ullsepas of Seulm, The tale-gatherer and diviner, may Zagyg forgive his prying, related this to the Lord Grenell, Herzog of the North Province, in a secret missive sent by courier eagle. “As was claimed by the Kettite before he succumbed to the duress of inquiry, a triad of mighty swords, unoerthly in dimension, does indeed stand beside the bitter sea. Their design encompasses many of the elements of the most ancient sword patterns of the pale Suelish barbarians which infest this cold and dismal place, but no creature which walks this world have I seen which could wield blades such as these. At my first attempt to divine somewhat of the nature of the swords, I was struck down as though I were but an overreaching novice, though all wise precaution had been taken. The Lore imp I had summoned to aid me was burned to ash instanter. I lay senseless upon the black stone for hours, my mind filled to agony with visions I could neither understand, nor retreat from. I saw endless boreal wilderness. I saw monsters of legend, vast, iron horned, brazen scaled. I saw men at feast, at love, and at war, but not men as we know, greater, without limit. My senses filled with time and smoke and the calling of crows, and the sting of salt water. But over all boomed and rolled the dark laughter. Wild and unending, deep with mirth and madness, beyond the understanding of mortal men. When at last the vision waned and I again commanded my own form, I stood and found I was no longer alone on that barren shore. Squatting on his long shanks atop a sea spattered boulder was an old man of appearance most dire and strange. Though the cruel wind froze the spray where it fell upon the rocky shore, he wore no clothing other than a rough kilt of seal leather. His fan-like beard and unkempt mane of hair were snowy white, but they did not hide the sky blue eyes, wicked and distant, he turned upon me. “Are you of the Cruski?” I asked him. He gestured towards the standing swords with a rune-scribed arm, if the markings were tattoos or scars I could not tell. He spoke in the common tongue, heavy with the accents of the north. The nails of his long, knotted fingers were heavy and sharp, like the talons of the golden sea eagle. “I will tell you one, southern bird.” He slid down from the boulder and stood upright, a full head and a half taller than I. He gestured past me, to the swords. “There were others before them, older”. He pointed to the nearest of the towering blades. His fingers twisted, they formed a runic symbol I did not recognize. “The sword of Thoar.” He said, as an invocation. I observed that the runes wrapped around his arm in a continuous spiral from wrist to shoulder. “These are forgotten gods? Gods no longer worshiped?” I asked of him. He looked at me for five slow breaths with an expression of deep consideration on his face. As he spoke, I watched as the blue of his eyes washed outward over the whites, until, save for the pit black pupils, his eyes were blue entire. I will admit to you, Lord, that I felt fear and trepidation in the presence of the man. He smelt of wild and preternatural magic, and no little of it. If there was not madness in his glacial eyes, there was at least contempt of sanity. Even as he spoke, I had begun a spell to hold him, so that I might more easily put him to the question and thus gain answers more clear in their meaning. He knew what I meant to do, I think, even before I began the binding. My power and skill in the Art is not small, as you well know, but I think he had but toyed with me from the beginning of our encounter. He stooped suddenly, and with the nails of his bare hand, he slashed into the very rock beneath our feet, a rune of unknown meaning. In that moment before the completion of my own spell, I was suddenly seized by unseen talons and born up and into the sky. I felt mighty wings sweep the air above me, though I could see nothing of the creature which carried me. I believe that somehow the old man had called one of the tremendous eagles of the etheric plane to do his bidding and remove me from his domain. The eagle carried me for many leagues before I was able to work my hands free of its grip and dispel the magic which had summoned it to this plane. I faced great difficulty in making my way alone through the hostile wilderness. It was some few weeks before I found a city worthy of representing civilization. I consider now that our compact is dissolved. I will not again dare that uncaring land or face the inexplicable sorcery of the white-haired man. Not unless sufficient recompense and formidable allies be made available to me. If you would have further attempts made in this regard, send to me the Knight of Tatters and his winsome fey vassal, along with Slyr the Sharper and brother Fastandus and also thrice the coin formerly agreed upon. Though the true nature and history of the Three Swords is uncertain and left to the Dungeon Master to determine, and to alter to fit his own campaign, some facts can be established. The Swords create a powerful Magical Alteration Zone extending for approximately one mile in all directions, including to seaward, and also below ground level, and above into the sky. In addition, Wyrd Greyhawk’s version, The Swords of the Old Gods, presents the possibility that any characters coming within visual range of the ancient blades may chance Atavistic Possession. The primal, elemental nature of the power of the Swords may magnify the inner nature of the player characters. As a characters choice of Class reflects who they are as a person, the PC’s class characteristics and stereotypical behaviors will become exaggerated and dangerously unbalanced. When first sighting the Swords of the Old Gods, Player Characters must Save VS Magic, taking into account their individual Magical Attack Adjustment bonuses or penalties derived from their Wisdom Scores. Those who fail to save have fallen beneath the influence of the Swords. A fighter may become a Shield-Biter. In this case, he always resorts to violence first to solve any problem. He gains +1 to hit and damage. He acts without regard for his own safety or that of his companions. He may continue to fight to -10 hit points. He also has a 15% chance of going battle mad in any combat which lasts more than six rounds. This is analogous to berserker rage and the shield-biter will attack all present until slain or subdued. A thief may become a Magpie. Such a thief steals compulsively and without digression from friend and foe alike. A magpie becomes obsessed with anything denied him, a treasure item, a bottle of wine, a girl, etc. All thieves’ skills are boosted by 25%. Practicing the art of thievery becomes the be-all of a thief in the throes of atavistic possession. A cleric may become a Godsman. In every situation requiring even the simplest and most inconsequential decision, the cleric will require time for theological reflection, to ensure that his actions do not conflict with dogma. A godsman casts spells at two levels higher than his actual experience level. He will also attempt to convert others to the worship of his god or gods at every occasion. A magic-user may become an Eldritch Seer. He then perceives directly the lines and flows of arcane energy about him at all times. This results in a constant Detect Magic ability which never ceases. The magic-user casts spells as though two levels of experience higher than his actual level. He insists on using magic for even the most mundane tasks. He develops a disregard for all things not related directly to magic, and an obsessive need to possess any magical item he encounters. There is a 15% chance that some form of madness, chosen randomly from the Dungeon Master’s Guide, may strike the magic-user for every day that he remains in this state. Once a character has fallen beneath the influence of the Swords, the Dungeon Master may wish to pass the player a note explaining the behavior changes he must portray. As with cases of PCs controlled by spell or monsters, the other members of the party who remain unaffected will have to figure out what has occurred and how to deal with it on their own. Once affected by the power of the Swords, characters will remain so until they move outside of the area of effect of the Swords magical alteration zone. At this point they are allowed to attempt to Save VS Magic a second time. If they fail this second attempt, they will remain subject to the Atavistic Possession until such time as a Remove Curse spell may be bestowed upon them. It should be noted that the atavistic possession bestows a sense of great freedom from social constraints and a feeling of clarity of purpose which is most gratifying. Those characters which are under its effects are unlikely to be co-operative with anyone seeking to return them to normal. 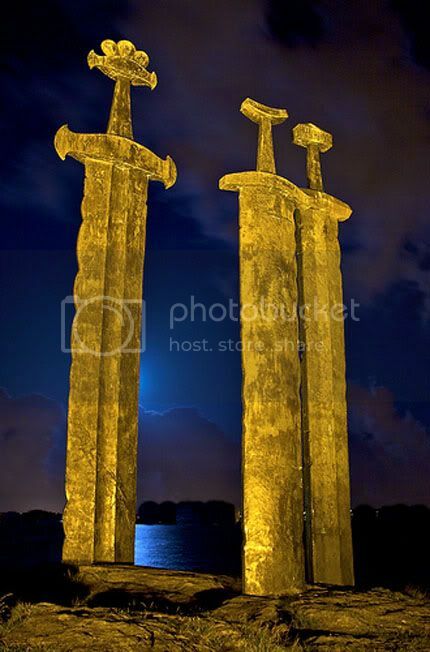 *The pics are of a Norwegian monument commemorating the battle of Hafrsfjord in 872. I bumbled into them whilst tooling about the internet and found them inspiring. Dig it. The Black Griffon of the Drachensgrabs. Special Attacks: Scream of Battle, three times per day, the griffon’s scream will force all who hear it to Save VS Breath Weapon or immediately fumble their next action in fear. Special Defenses: The griffon’s wings make no sound, it’s passage will not be noted if the creature is not seen. 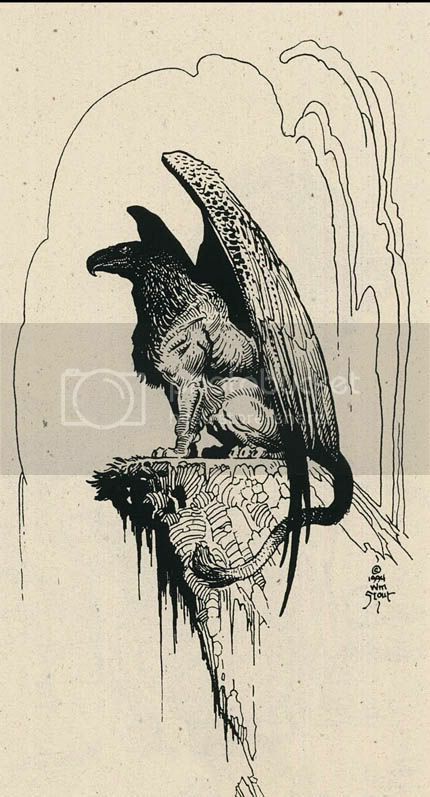 Said to be more than twice the size of other known griffons, the great Black Griffon of the Drachensgrab Mountains is held by many to be a harbinger of disaster, its appearance an omen of coming events both terrible and important. One week prior to the battle of Splintered Oaks, the Black Griffon was reported to have dropped without warning from a clear blue sky to slay and devour the favored war horse of Glewning, Duke of Dweryn. 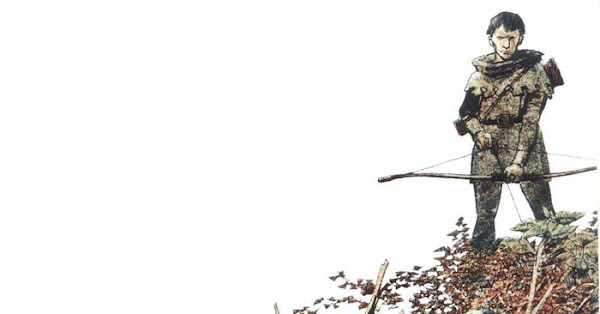 The death of Glewning, and the ruin of his House in the aftermath of his loss beneath the Splintered Oaks was later said to have been foreshadowed by the actions of the Black Griffon. Some hold it was the griffon laid a curse upon Glewning and his kin by its actions, others that the beast was but an omen sent by the Fates, or Istus, like the dreaded Black Dog. Some hold that it was merely chance, or perhaps an unfathomable jest of Zagig. Many words have been spent beside late night watch fires in argument over the nature of the Black Griffon. Little of worth has been gained. Certainly, the beast is a terrible opponent to face in combat. Upon this, all accounts do agree. Even the most faithful of war horses will refuse to bear their riders within reach of the Black Griffon’s scythe-like talons. Pladothemed the Infirm conjectures that the beast has a secret purpose. He has charted the sightings and the reported encounters with the Black, and believes that a pattern may be discerned in its movements. 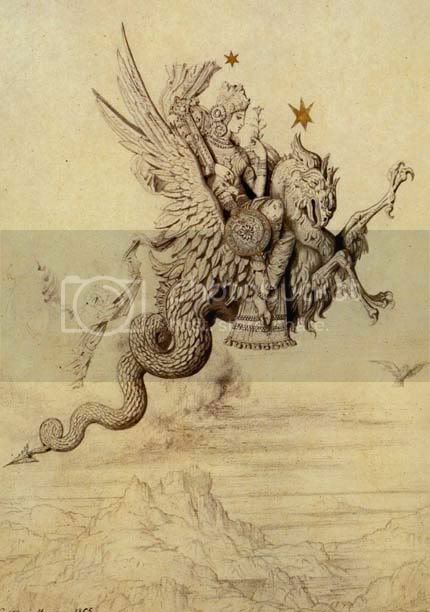 The Trembling wizard avows that the griffon wings forth to various places upon the Oerth in accordance to the arrival of certain dates of arcane relevance as noted in the common calendar of the Flaness. The accuracy of Pladothemed’s theory is contested, however, as he refuses to reveal more. Tales concerning the Black Griffon are often contradictory regarding its behavior. Some have painted the creature as a benefactor of lost souls and a guardian of travelers, while others depict it as a remorseless killer with a cruel and malign humor. The truth may only be discovered by those who venture to seek the creature amongst the rocky spires of its home. This of course, is no mean feat. The Black Griffon is said to nest in the shattered top of an ancient tower in the unknown heart of the Drachensgrab Mountains. Choked with orcs, goblin haunted, and infested with monsters little less formidable than the Black Griffon itself, only fools, the mad, and adventurers willingly dare the horrors of the Drachensgrabs. Special Attacks: 50/50 chance for either; Spit venom to 100 feet, Save VS Poison or be paralyzed for 2d8 rounds, or, Constriction for 1d8 points of damage per round. Victim must successfully Bend Bars/Lift Gates to escape the griffon’s coils. A griffon of this sort possesses the body and tail of a giant serpent, rather than that of a lion, after its eagle’s head, taloned forelegs, and sweeping wings. Less often encountered than their cousins of the leonine type, they are more likely to be found serving as mounts or guardians than as free wild creatures. A serpentine griffon is at best an untrustworthy servitor, however. It requires constant reminders of its master’s power and will or else it is likely to indulge its own appetites at any opportunity. Serpentine griffons are more commonly encountered in warm or southern regions. The lair of a serpentine griffon, if it is of their own choosing, will be a location that allows ample sunlight for basking, preferably on rock. They do not seek the heights to nest as do other griffons. A serpentine griffon left to its own devices is likely to act in a manner similar to that of a dragon. It will find a lair to its liking and then demand food and tribute of passersby and the local inhabitants of the area. Special Attacks: Stoop, if a griffhound has sufficient space to reach its top speed in attack, (50 yards required), its first attack will do double damage, and also topple the victim if they fail to roll below their Strength score. Lean and tawny hunters, Griffhounds combine the features of hawks and coursing dogs as griffons do with those of eagles and lions. Wingless, but with the head and clawed forelegs of a huge golden hawk and the body and haunches of a great sight hound, griffhounds hunt open land in small packs. Griffhounds may be encountered in areas of savanna, steppe, desert, or other open range or grassland. The creatures habitually lair atop the highest point of land within their range of vision. This extends for miles due to the keen sight of their hawk eyes. Griffhounds are roughly equal in size to the largest normal wolves, and while they are unlikely to attack humans or humanoids unless desperate, trapped or very hungry, once combat has begun they are fearless and need never check morale. Though it would seem likely that griffhounds were at some point creatures created by deliberate magic, they are quite successful in their role as predators of open land and behave as natural animals. As the only sort of griffonish beast which may be truly trust worthy when taken as a pup and well trained, perhaps due to its canine half, it goes without saying that griffhound eggs will fetch a good price if offered to the correct buyer.